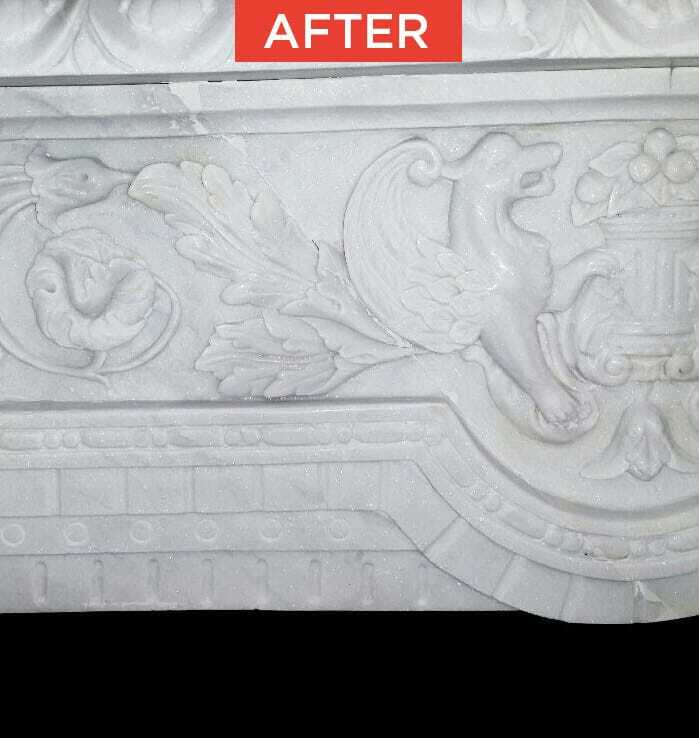 Restoration of marble and natural stone. The restoration of marble and natural stone is centered on surfaces that, due to long periods of use or the presence of pathologies, show a significant level of deterioration. When restoring marble or natural stone the main interest is the conservation of the original properties, although it might not always be feasible to restore their original aesthetics 100%. The technical team of TINO Stone Care, after years of study together with the R+D+I team of TINO Natural Stone, is able to detect the origin of the stone pathology, eradicate it and apply 100% effective solutions. 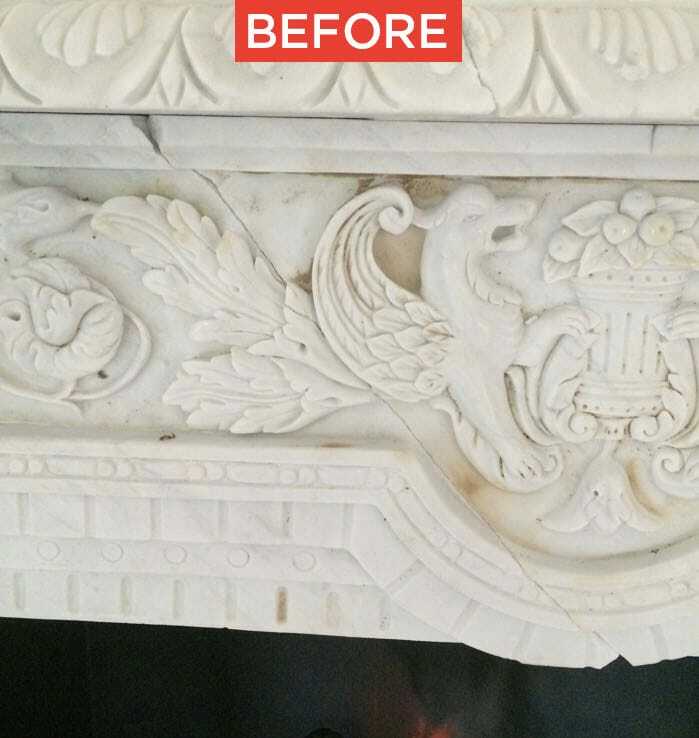 However, while in the Recovery service the stone can return 100% to its original aspect, the Restoration of marble and natural stone, will make the material look healthy and beautiful again, although it may acquire a slightly different aspect compared to the original one. Objective 1 – Recover the original appearance of the stone: the surface presented marks and had highly deteriorated areas due to use, the weather conditions and in general the pass of time. Objective 2 – Improve resistance against staining: foreseeing that the surface will continue to be exposed to staining agents, its absorption capacity will be reduced. Objective 3 – Facilitating cleaning and maintenance work: considering the nature of the surface, its texture and its kind of use, it will be treated to reduce the work of maintenance and increase its performance, in order to save resources, money and time. 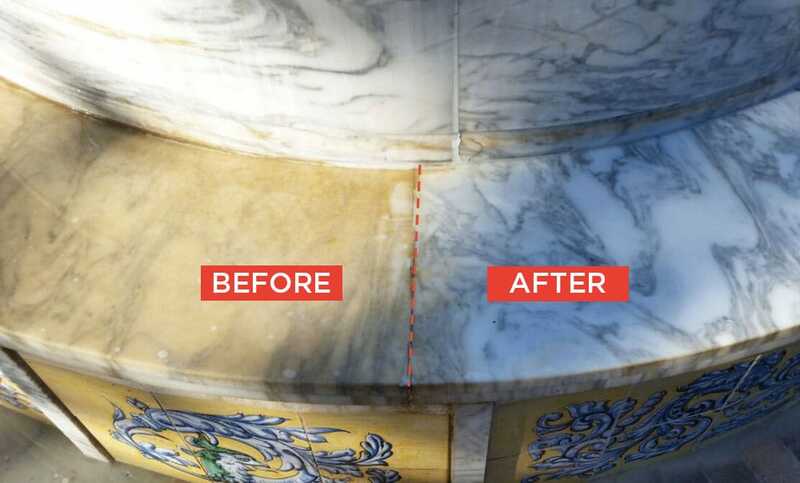 +Brushing texture + Cleaning Sanitizer and Descaler + Mechanical Repolishing: after the pass of time and an “ineffective” maintenance process the marble presented a high level of dirt, impossible to remove in ordinary cleaning process. The surface lost all of its shine due to the continuous action of the calcareous agents. 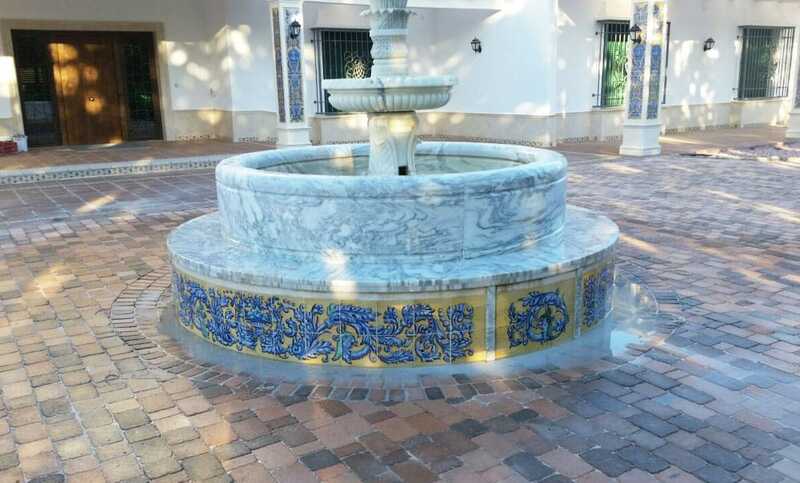 A thorough cleaning was carried out using marble products from TINO Natural Stone. All of them harmless for the stone but efficient in eliminating the different types of dirt. This action was accompanied by the use of brushes with different grain sizes. Finally, mechanical repolishing was carried out on site. +Oil-Hydrofuging Treatment: to reduce the capacity of absorption andto make the stone more resistant to staining. It is carried out with an exclusive product from TINO Natural Stone, capable of creating a completely waterproof shield. This treatment minimizes the absorption of the Natural Stone respecting the permeability required, so we avoid the appearance of pathologies that can cause changes. The marble of the fountain was finally completely restored with techniques and materials that respected its essence and did not generate modifications or adverse effects.